Updated August 19, 2014 at 10:50 pm: The TTC board unanimously adopted the proposals in this report with amendments. Some of these were intended to ensure clear understanding that approval was only in principle and subject to the review process in the 2015 budget. In what proved quite a surprise to me, Chair Maria Augimeri moved a request for a set of reports related to service and fleet plans. The text of this came directly from a deputation on the CEO’s report which, at that point in the meeting, I had not actually presented because the Board took the agenda items out of sequence. Here are my deputation texts, one on the “Opportunities” report itself, and one on the CEO’s report. The motion I proposed and which the Board adopted is in the second item below. Although there were questions about details and about the manner in such a far-reaching set of proposals appeared on the Supplementary Agenda of the last Board Meeting before the election, there was broad support for the content. Of the Mayoral candidates, even Mayor Ford has spoken favourably about many of the proposals with the exception of the widespread rollout of PoP (self service) fare collection and the move to time-based transfers/fare receipts. Only John Tory has been strongly opposed choosing to take a hard-line tax-fighter stance that is hard to swallow in light of his own multi-billion dollar transit plans. Tory also does not understand that a staff report at the TTC only makes proposals for what should or might be done — it is up to Council to decide on priorities and funding mechanisms. Tory continues to disappoint as a candidate who has more bluster than substance, a trait he shares with the current Mayor. Updated August 15, 2014 at 8:00 pm: Detailed comments about the proposal have been added. i) expand the overnight bus and streetcar network. At the heart of this report is a recognition that Toronto’s transit needs to improve not just with the construction of a few rapid transit lines serving limited parts of the city in the mid-to-distant future. What riders need and will use is a service overall that is more convenient and less crowded. This requires improvements to the bus and streetcar system that have been ignored for too long. Many of the proposals here will be familiar from the Ridership Growth Strategy (RGS) and the Transit City Bus Plan (TCBP) of the Miller/Giambrone years, and it is no surprise that TTC management wants to return to an operating environment that welcomes passengers rather than treating them like so much baggage to be jammed in wherever it will fit. This was a feature of RGS although it had a notable exception when it came to peak streetcar service because already the standard line was “we have no more streetcars”. Reduced crowding isn’t simply a matter of giving folks more elbow room, but of reducing the situations where passengers cannot move around especially at stops where it may take ages to get one or two riders out the door, and one or two in to replace them. Statistics that measure “efficiency” by packing density, but don’t consider the wasted time of the operator or the vehicle, are self-defeating. All-door-loading and Proof of Payment (POP) fare collection will also improve space usage in vehicles, at least on those routes where the practice is not already common. Many operators already load through the rear doors during peak periods if only to get people into their buses and streetcars. Service scheduling and management are also important. If buses and streetcars cannot achieve their scheduled trip times, they will always need to be short-turned. However, even worse are the convoys of vehicles that form either because short-turns are not managed properly to fill gaps, or because vehicles travel across the city in packs (some originating at terminals) with little evident attempt to space out service and even the load among vehicles. A low “average” load can represent simply a pack of buses with a few stuffed full and the rest over half-empty because everyone tries to get on the first vehicle. Evening out the service will no only make better use of its capacity, it will reduce the frustration riders feel when they peer into the mist (or into a NextBus display) and find there is no bus or streetcar nearby. Aside from the changes that more generous loading standards will bring, the TTC would establish a core network with various classes of improved service. At its most basic, this network would operate at least every 10 minutes, all day. Riders would know that certain routes could always be guaranteed to show up fairly soon, even if they have just missed their bus or streetcar. Actually implementing this is less costly than it may seem because many routes already fit the pattern during most or all of their operating periods. The proposed map has changed somewhat from the TCBP in that it includes some routes whose branches might operate on headways wider than 10 minutes, but the trunk of the route has 10-or-better. Also, the streetcar service on Lake Shore Blvd in Etobicoke, omitted because it was not a bus route, is on the map. For the network as a whole, all-day service would be provided to many locations where it now disappears during some off-peak periods. This recognizes that “access to transit” requires that it be available for both the “to” and “from” trips, and that a superficially dense transit network is meaningless if half of the service vanishes at off-hours. Two changes are proposed for the express bus network. First, there would be more routes with express operations, and more routes that already have peak express service would see off-peak express buses as well. Second, the 14x Downtown Express routes would have improved service and would convert to a regular fare rather than the supplement they now charge. Finally, the Blue Night network would be expanded to reflect the growing demand for late night service and to fill in some gaps in the current network. All fares, be they monthly passes or single cash payments, will buy unlimited travel for some period of time without regard for the niceties of rules about transfers, stopovers, and riders who give up and walk only to be overtaken by a vehicle. Riders whose travel requires multiple short trips will no longer be penalized compared with long-haul commuters who get the same amount of travel for one fare. There will be no question of whether a “transfer” is valid as this will depend only on the time “stamped” on it either in ink (for a hard copy fare receipt) or in their fare card. The Presto system will not have to “learn” about transfer rules and its implementation as a time-based scheme will be greatly simplified. When integrated regional fares arrive, the “two hour fare” can be valid across boundaries. Additional Transit Signal Priority (TSP) with the rate of installation being doubled from the present 40 sites per year to 80. Provision of “queue jump lanes” at busy intersections where right turning traffic can interfere with bus movements. TSP has been around on some routes, notably the streetcars, for many years, although the degree to which is kept in working order is open to question. Two important questions need to be asked about “priority”. Should transit get priority even at intersections where there is a strong demand in the cross-direction and every available second of green time needs to be available to any traffic that can use it? Nearside stops can actually waste green time by holding traffic while a transit vehicle serves the stop. Should TSP be designed not just for “standard” operations, but have support for unusual conditions such as giving left turn priority to diversions and short-turns, not just at a few locations where left turn movements are scheduled? Queue jump lanes have been on the TTC’s wish list for years. They are specific to bus routes, and can only be implemented where there is space to widen the approach to an intersection. This layout may not fit well with others who design for cars, cyclists or pedestrians. A related issue is that these lanes require dedicated space 7×24 even though the problem they address may only exist for a few peak hours. Some of the proposed changes do not require any additional peak vehicles, but a few do, and this brings us to a debate about how the TTC should address growing peak demand in the short term, even without any new service policies. It is unclear what the need for more storage has to do with off-peak service, but there is certainly the question of leasing space for some short-term overflow pending the availability of McNicoll Garage. However, the TTC seems to be double-counting that garage here both for policy-based service improvements and for McNicoll’s original intent, the ability to expand the fleet for additional demand. What is missing from the proposal is an integrated view of requirements both due to “normal” transit growth, and the additional needs brought on by the new policies (including any induced peak ridership). In other words, is McNicoll Garage enough, or should the TTC be planning for a second new garage? How do future rapid transit lines (whatever their technology) affect long-term planning? Similarly, some peak period streetcar improvements are said to require some of the 60 new streetcars proposed, but not yet funded in the “below the line” Capital Budget. The real issue for the TTC, short term, should be how long it will keep its CLRV fleet in operation in parallel with the Flexities to supplement service while the Flexity Fleet builds up and represents a real net addition to fleet capacity, not simply a trade-in of old vehicles for new. There is no mention of the additional vehicles that will be required for the Waterfront services should construction of the eastern line be advanced. The report proposes that bus routes be scheduled to be less crowded and presumes that they will continue to have some level of productivity. What is missing is any cutoff line by which new services such as express buses would be compared to the regular service. Does The Beach, for example, get a regular fare express bus just because the route is already in place? How many parts of the city should get parallel express services while others must make do with their “ordinary” bus routes? If new buses are to be ordered and garages built to house them, should this capital cost go toward more “regular” service, or should it be concentrated on express routes to downtown? How will the TTC decide to allocate new vehicles and operators? Treat the transit network as something that needs system-wide improvements, not a quick fix here and there where residents can get politicians to take an interest. Toronto is in the midst of an election campaign where candidates are preoccupied by drawing rapid transit lines on maps. For most candidates, the surface system simply does not exist even though without it, most riders would never reach the subway lines some are so eager to build. Surface transit has been strangled by an administration that values tax cuts over the quality of service and clearly feels that transit users are a coddled, oversubsidized bunch. When this report comes to the TTC Board for debate, there will inevitably be claims that this is a policy for candidate X or a repudiation of candidate Y. There may even be some factional jousting to defer this report so that it does not officially become part of the record with a TTC recommendation attached. That would show just how little some politicians care about transit riders. This proposal is a plan to improve transit for everyone, and it should not be claimed as any candidate’s exclusive property even though aspects certainly overlap elements of some platforms. Transit is too important an issue for good ideas to be held hostage to party colours, for a “red” idea to be dismissed out of hand by “blue” supporters. 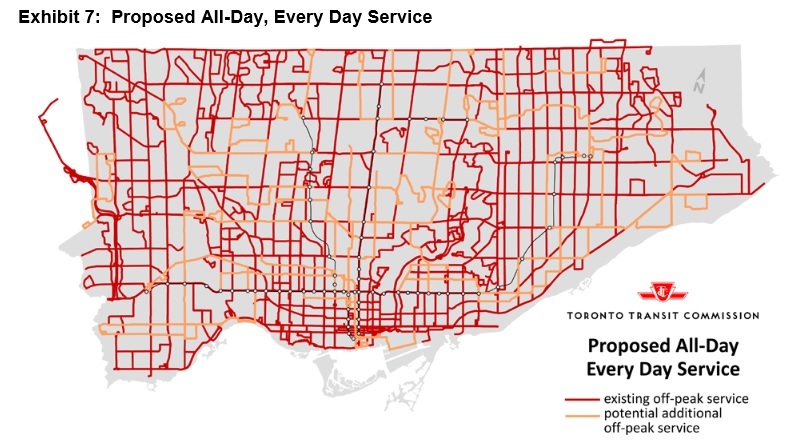 Toronto deserves a Council debate that will address head on the basic question “Where is my bus” with an answer that does not involve yet more doodling on the rapid transit map of decades to come. This entry was posted in A Grand Plan, Fares & Fare Collection, Finance, Service Cost and Quality, Transit. Bookmark the permalink. A lot of people, including Jarrett, seem enthralled with the idea of longer and longer transit routes while others point out the problems maintaining schedules. I think that longer routes are not the answer. The answer is shorter routes. When Eglinton crosstown opens lets split all north south routes at Eglinton and Bloor, Wilson-York Mills-Ellesmere should also be included as a split point. Lines would only be 2.5 miles (4 km) long and schedule adherence would be improved. Sure you would have to transfer more often but that is a small price to pay for schedule adherence. East – West lines should be split at Yonge and at Spadina Subway and once The DRL, aka Don Mills subway, is built at there also. Jane St. and Kennedy Road would also be suitable termination points. With all the short lines there would be no longer the excuse that the line is too long. Also think of the improvement in the fitness of Torontonians from the extra walking. Jarrett Walker has it all wrong, shorter, not longer lines is the answer to more reliable service. Steve: I am reminded of Goldilocks and the Three Bears. Some lines are too long, some are too short, and some are “just right”. If anyone wants an example of the problems with extremely long routes that, on paper, provide a one-seat ride, just look at 501 Queen. If it were not for the disappearance of the Kingston Road radial line to West Hill, we could have a single route running almost from the eastern to the western boundary of the megacity. The question is always “where do people want to travel”, although this is tempered by the argument that if the through service existed, demand would appear out of thin air to utilize it. What is missing, of course, is the fact that just having a line on a map does not guarantee an attractive, reliable service. In the name of making an unbroken route for some, do we create a route that is so unwieldy that it provides poor service for everyone, even those only travelling half its length or less. Transfers work when they are between frequent services and can occur in reasonably comfortable, convenient surroundings. Every time we ask someone to get off their bus, trek across an intersection and stand waiting for their connection that may be somewhere in the distant mists, we discourage travel and emphasize the benefit of the one-seat ride in an automobile. By contrast, we cannot provide a one-seat ride for every trip, and the balancing act is to make the system as attractive as possible for the most number of riders. Linking routes into single lines fixes some problems and creates others. Chopping routes up could simplify line management although it would more likely simply cause an increase in the amount of “terminal time” consumed. Any arbitrary route design philosophy — radial vs grid, transfer vs one-seat ride — will produce a network that offends someone’s sense of what transit service should look like. What might work in a medium size city where a two-hour long route is impossible without falling off the edge of the map, is impractical in a large one where the mechanics of line management (not to mention basic issues such as driver endurance) overtake philosophy. This is perhaps one area where a Public Private Partnership could truly work. Licence private companies to enforce the By-Laws with the proviso that they get paid only a percentage of monies collected. Toronto’s streets would soon be free of illegally parked cars and of those making illegal turns. Steve: Another observation made by someone within the TTC was that the reliability on 501 Queen went up quite noticeably when it ran only to Humber Loop. Since I used to live on Davisville Ave, how has the service on Davisville fared since it was combined with Bayview into a rather long route? I hope people realize I was being partly facetious in my call for shorter routes. If it were not for the disappearance of the Kingston Road radial line to West Hill, we could have a single route running almost from the eastern to the western boundary of the megacity. Another observation made by someone within the TTC was that the reliability on 501 Queen went up quite noticeably when it ran only to Humber Loop. Moaz: And with the underpass under the Gardiner and rail corridor connecting the Humber Loop to Lake Shore now closed, and the 501 only running to Humber Loop can we hope for an improvement in reliability? Unfortunately I’ve already heard complaints that service is even worse, despite the shorter route. Someone claimed that some of those cars that used to go out to Long Branch are being used elsewhere (not on the shorter Queen Streetcar). Is there any truth to that claim based on car scheduling? Steve: The scheduled service on Queen east of Humber is identical to the August version when half of the service was allegedly bound for Long Branch. In the peak periods, there are 5 fewer cars on the line corresponding to a headway of just over 10 minutes to Long Branch at a 50+ minute trip time. At the risk of sounding a tad snotty, anyone can look at the service summaries for August and September (both still online) to see this. Steve, the service summaries are one thing, but actual operations are another, as you have shown so often before. During the Ex, 501 saw a preview of the near-future when ALRVs are retired en masse. CLRVs made up a majority of the service as far as I could see, and yes those carrying a gap were crush-loaded. The other thing, as I have mentioned before, is that cars in Long Branch service would basically never be short-turned before Kipling, while Humber cars could be turned at Sunnyside or even sooner. People along The Queensway — and there are more and more riders as the condos and townhouses go up east of the Humber — learned this the hard way, and preferred Long Branch cars because they had some assurance that they would not get turfed at Roncesvalles. The Long Branch cars had a distinctive set of run numbers, but what I see right now is a homogeneous mass of Humber-type run numbers. What this tells me is that any westbound Queen car may be short-turned before Humber. Steve to what degree, in the case of a very long suburban bus route, would a sophisticated Transit Signal Priority system help maintain service if it was coordinated with a much improved AVL. Would not the result of the bus behind headway getting signal priority and the one ahead not, greatly reduce some of the issues currently with headway management? It would still require the drivers leave close to headway, but would this not address some of the issues that accumulate in the route, and thus lengthen the line that can be reasonably run? A bus route would still require reasonable stop locations for headway maintenance and recovery that included facilities. Also have the issue of staff getting back through the route for reasonably normal shifts. Steve: Among the problems with very long routes is that the demand is not uniform over the entire route. On surface routes (unlike the subway), the frequency is tailored to demand (at least allegedly) and we don’t “waste” buses running frequent service out to the ends of the earth. Another issue is that there will always be disruptions, but the longer the route, the more complex it will be to put things back together again, to the point that on a route like Queen, something is always happening somewhere. Finally, there is the driver who would face an interminal one-way trip across the city. Frankly, before we start talking about a bunch of cross-city routes, I want to see some origin-destination data that establishes a requirement for this type of service. Through routes may be an ideal in a city that is at best one hour “across” with a central core, but they are quite another matter in a place the size of Toronto. Let’s look at long routes from a statistical analysis point of view. Let’s say your odds of getting through any 1 km of a route with out any delay is 99%. or 0.99. Your chances of getting through 2 km with out a delay is 0.99 squared, .99^2 which is 98%. If you have a line that is 25 km long then your chances of getting through without a delay is 0.99^25 or 78%. Long routes are statistically going to have more delays if they run in mixed traffic than short routes. TSP may reduce it slightly but it will never get rid of it. The next analysis requires that you take into account “Queuing Theory” which says that nothing is ever uniformly distributed. Think about this next time you are buying groceries and no one is at the cashier until you get there and find find yourself third in line. I will have to re learn queuing theory from my 42 year old notes before I delve too far into that. “Frankly, before we start talking about a bunch of cross-city routes, I want to see some origin-destination data that establishes a requirement for this type of service. I would be very surprised myself, given the distances involved, if people would generally choose to live that far from work, or engage in shopping at the West Mall, if they live in Scarborough. I would expect there to be some demand, to cross Yonge however. The question in my mind would be how much transit demand would there be at say Finch and Don Mills, that would want to go as far west as say Bathurst. I would be more interested in the impact of these improved TSP and AVL systems and their coordination on the routes that will be cross running things like the Stouffville RER, on Finch or Steeles in the future, and understanding the impacts of improve coordination with the lights of routes from Morningside to Yonge. This is after all a long trip in itself, very subject to many potential issues. There are many existing long bus routes now, like Lawrence and Finch East that run something like 16km+ one way. 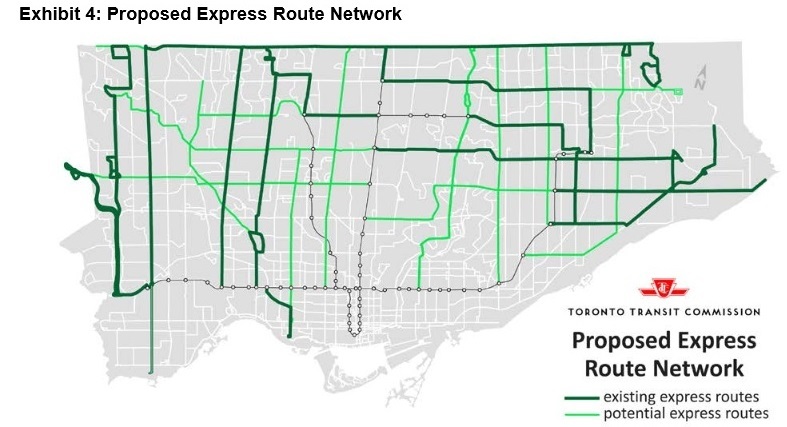 Tighter headway compliance, as someone noted of the issues on Finch East would be good, and I am interested in the degree to which these existing routes that are required to push the bounds can be helped. 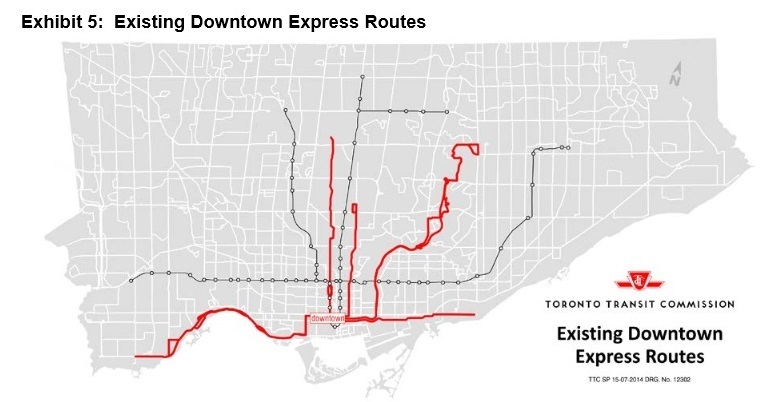 I would say, that the cross city routes in Ottawa for instance, which often have the help of a dedicated transit way for portions, and used to pause a few minutes in the core, are no longer than these routes just extending east from Yonge. I would hope that these new opportunities for performance improvement will be applied to these long routes, before anyone dreams up any new ones. Service to the airport grounds may be the service that makes the most sense, however, it is likely this should be done by extending the Crosstown to the airport, which would then truly be aptly named. I would not expect it to get rid of it entirely, although I would think that TSP that favoured only the buses that were actually behind headway and not all (TSP actively adjusted for AVL information and correct headway) should help further. You are right in that randomly distributed errors will still accumulate, and more critically is the issue of a couple of delays exceedingly threshold values. The minute that delay does become sufficiently large to exceed the TSP advantage granted behind schedule buses vis-a-vis others, you are in effect going to force a large gap. Some of which can be allowed for by actually inserting hold points (but only some), but no you will never reasonably overcome all. Hence my comment that it may allow you to extend the distance before it becomes unmanageable, however, not beyond a certain point. That point would itself depend on the nature of the route, and the frequency and duration of delays that would normally arise on the route. The paper I had noted previously is an interesting read, in that it discusses conditional TSP, conditioned partially on providing priority only to those on or behind headway. It strikes me that this requires a very advanced system, with a great deal of information with regards to vehicles routes and headways, as well as likely delays the bus is driving into. However, still you are correct, it will not eliminate the issue, and of course there are areas, where in effect a bus will be driving into a virtual impossible situation if it stays on route, and that will destroy route and headway management regardless of AVL and TSP coordination. The issue in my mind is not extending routes still further, but improving routes that are currently too long to manage well. However, having a route go further than the current longest bus routes means you will essentially always have an issues, especially in that delays do seem to have a high degree of auto correlation (both meanings).